The Solar PV Industry has created almost half a million job opportunities in India since 2010. India is also the fourth largest renewable energy employer in the world with solar PV opportunities contributing the major portion of it. As a result of the fast pace growth of solar in India (CAGR of 80%! ), there are lot of new entrants entering the solar market every year. This has increased the competition level, naturally. Selling solar is challenging. That is why there is a humongous need in the market for Solar Business Development/Sales professionals. If you wish to be a real deal closer, you need to be fully equipped in every possible way during all stages of your Solar PV Sales process. Solar Mango is here to assist you in this. 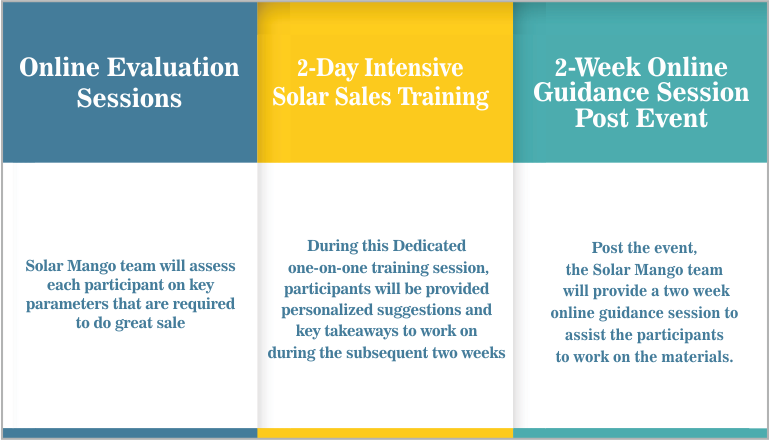 Solar Sales Job Bootcamp is a personalized 2-day career guidance session – tailor-made just for those who wish to succeed in Solar Sales. Individuals who are keen on a sales, marketing or business development positions in the Indian solar sector. Promoter run solar companies where the promoter himself/herself is responsible for the sales & marketing activities. Why do you need Solar Sales Guidance? Most solar companies require Sales professional with a ready-made combination of both solar technical knowledge and really good communication and presentation skills. As you can see, there is clear gap between the company’s requirement and candidate’s expectation. Solar Mango’s Sales Job Bootcamp is specifically designed to bridge this gap. What do you gain by attending this sales training? Unique training methods with a combination of awareness creation, personalized tips for improvement, and specific opportunity suggestions. What is unique about Solar Mango’s Solar Sales Job Bootcamp? Focus – There is no such program currently anywhere in India (or the world) that has a special focus on the sales & marketing roles only for the solar power sector. The program is a two day intensive bootcamp session at Chennai on Jun 27 & 28. The bootcamp will prepare all the participants fully to do far better sales for the solar sector, as well as equip themselves better to get a sales/marketing job in the Indian solar energy sector. All participants will be provided certificate of participation. Based on specific profiles, Solar Mango will also endeavor to refer specific participants to companies based on the profile fit of the candidates and the companies. The total fees (excluding service tax) is Rs 10,000. The fee includes all materials, and breakfast and lunch for all two days.